You can create a tracking source after you’ve purchased your tracking number(s) and then assign that new tracking source to specific tracking number(s). 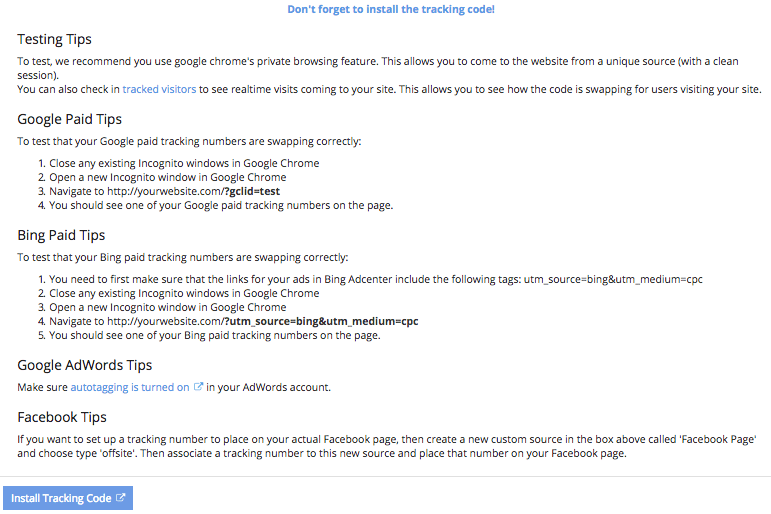 You do this by going to the tracking sources page, Numbers > Tracking Sources. Click New Source in the upper right hand corner. When creating a new source, you have the option of choosing one of our preset sources (where all the work is done for you!) or creating your own custom source. 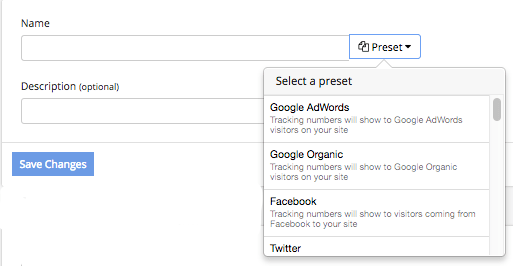 If you choose one of our preset sources (such as Google Adwords, Bing Organic, TV etc), you won’t have to modify source (you can modify the name if needed). Name: Your custom naming convention. Description (optional): Optional field to add additional content. ONSITE tracking source is used for tracking numbers that will be dynamically appearing on your website when visitors come to your site from the source you are setting up. ​Onsite/Offsite sources are changed by clicking on the toggle switch. If you choose Onsite as the type, you will then need to tell the system how to identify visitors from this source; either through information in the Referring URL field or the Landing URL of those visitors. In general, you want to identify a source using landing URL when you control the ad destination URL (i.e. in most online advertising situations). You would use referring URL when you do not control the URL that your visitors are coming in on. In the example above, we set up a new “Online” source to track Craigslist visitors. You will notice that we put craigslist in the referring URL field. This means that anytime visitors come to the website from a craigslist URL, they will see the tracking number(s) that we associate to this source. Use the Build a Regular Expression with Scriptular options below the referring and landing URL fields to help build the right parameters to track your new source. Here you can capture the cost per call either derived from a specific monthly budget or a per call custom cost field. When events are triggered without any visitor data, you can associate some data with the tracking source that will be passed on to Google Analytics event. 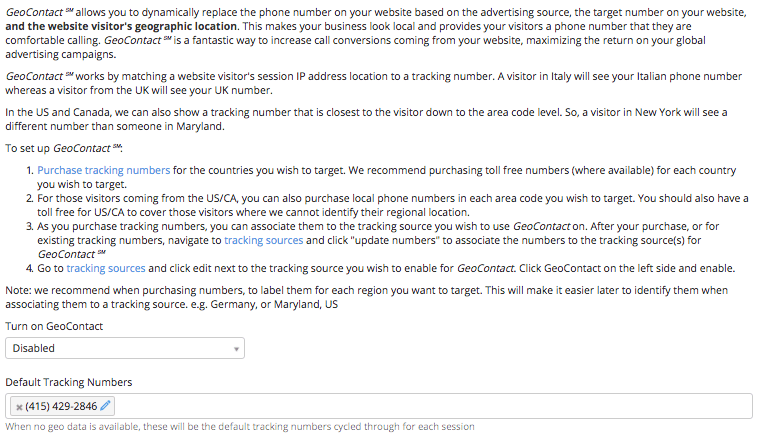 GeoContact is a proprietary tool that allows you to dynamically replace the phone number on a website based on the tracking source, the target number and the visitor’s geographic location. We match the visitor’s IP address to a tracking number. A visitor coming from Italy will see an Italian tracking number. A visitor from Australia will see an Australian tracking number. In the U.S. and Canada we’ll show a tracking number that is closest to the visitor’s location. Here you can associate your tracking number(s) to this tracking source. To activate this button you must save changes before you can tie numbers to it.